These were some damn fine comics, with issue seven wrapping up the "Deathlok Nation" storyline wonderfully and issue eight serving as a delightful one-off that starts sort of weak but finishes with great strength. 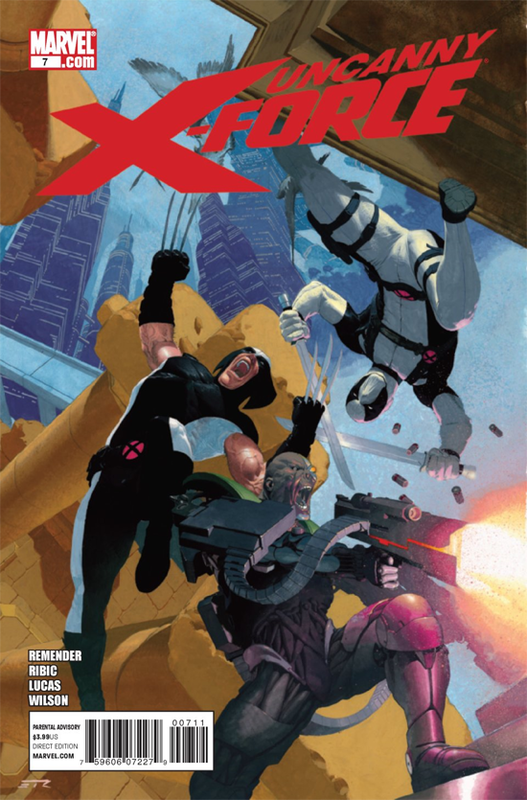 Uncanny X-Force is quite possibly the best X-Men-related comic coming out now--with X-Factor being amazing but so barely related to the X-Men that I don't feel bad saying such things about X-Force. Rick Remender has the perfect mixture of violence, deep introspective thought, and dark (and I do mean dark) humor, with issue seven serving as a great display piece for his skills. 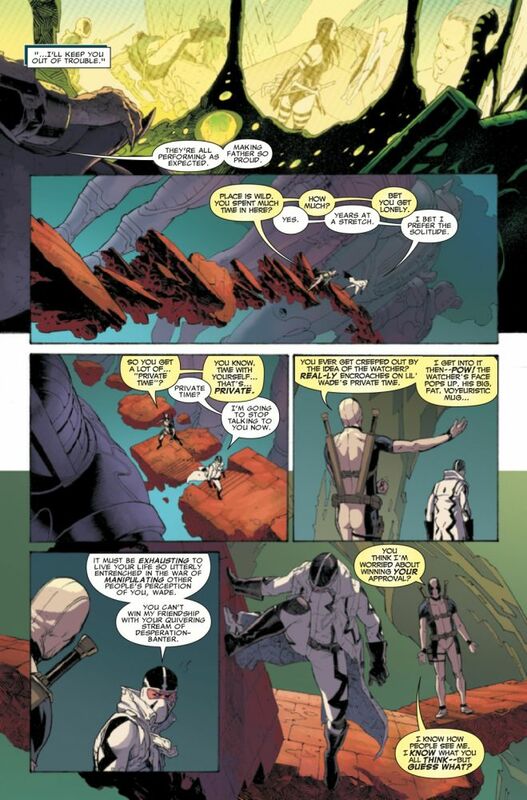 Deadpool and Fantomex don't quite get along. 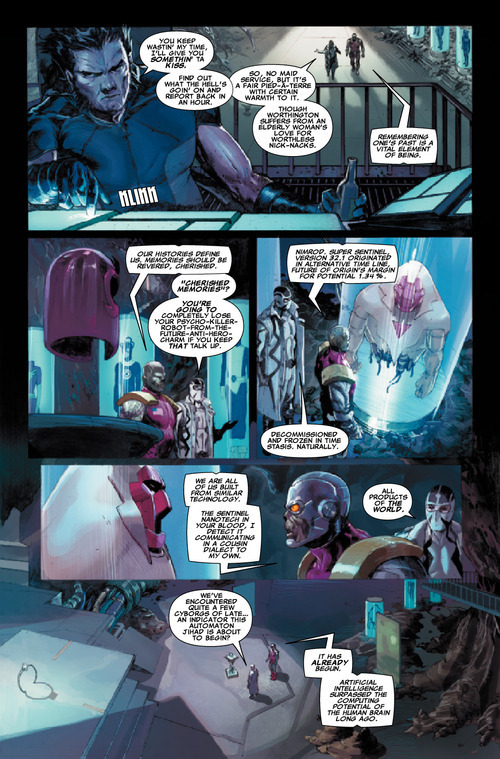 As the team fights to prevent a perfect future (odd, I know) Deadpool does some serious introspection--showing that Remender and Daniel Way are probably the best writers of the character when it comes to actually advancing his personal growth, Fantomex shoots a whole lot of Cyborgs, and Esad Ribic turns in some nice art of the bizarre-looking, "The World". Seriously, this is some crazy-but-great-looking stuff.The conclusion to Uncanny X-Force #7 is great, with a cliffhanger that left me scratching my head (in a good way) and genuinely wondering just where Remender could be taking this story in the future. 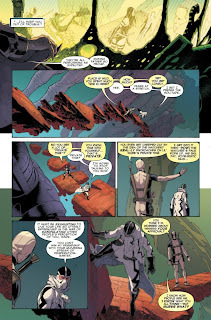 Issue eight starts out with the team in their base looking at old artifacts and discussing deep thoughts, which is interesting and all but I would have been bored if it weren't for the fact that I spied the helmet of Xorn! Xorn, from Grant Morrison's New X-Men who was later re-written to be something stupid but was originally Magneto in disguise in the coolest twist ever! That definitely gave me a geek-gasm. Anyways, this issue is mainly about Warren Worthington trying to face down his inner-monster in the form of Archangel (see the bottom of this post for an end-note explaining the whole Angel/Archangel deal, its confusing) through help from his girlfriend, Psylocke. 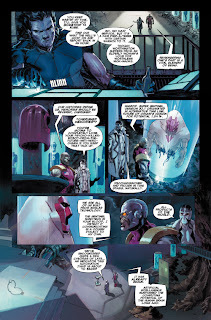 Oh, and the old villain the Shadow King shows up with Psylocke fighting him. The issue is at first just okay, but then a really great twist occurs showing that maybe the Archangel personality isn't as crazy and homicidal as we think, making that twist alone result in me bumping up the score of the comic some. That is a lot of saliva. Overall, Rick Remender is making some incredible comics here and I wouldn't be surprised if years later this is collected in some sort of big omnibus because it is remembered so fondly as being incredibly great--which it really has been. 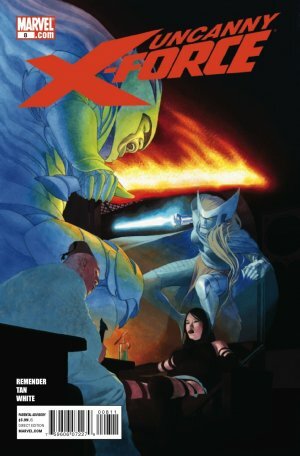 Don't sleep on this series, raid the back-issue bins and start reading it! 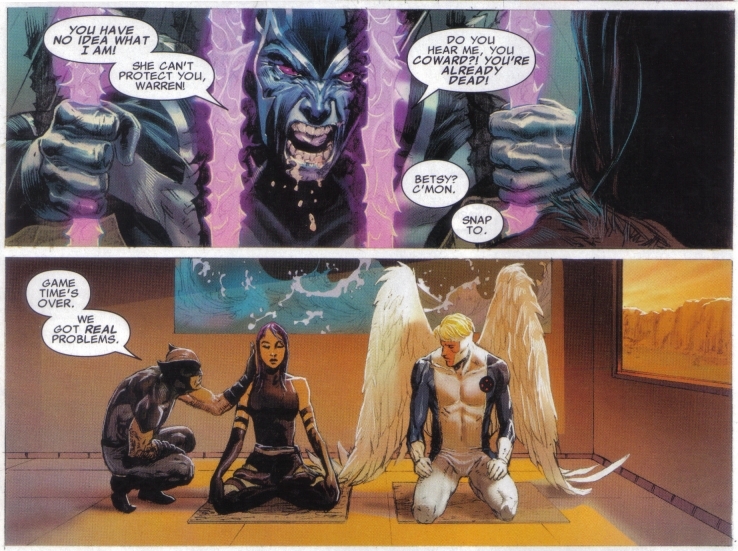 End Note: Angel at one point made a deal with Apocalypse (an evil mutant guy) which gave him metal wings and turned him into the bloodthirsty and violent Archangel. He overcame the evil but kept his appearance before shedding the metal and discovering he had his normal wings under the metal ones, and he seemed normal again. However, when his normal wings were cut off some time ago, his metal ones popped back out and now he can change back and forth between his normal Angel self or his Archangel self, but his dark violent side always tries to come out. Yeah, its confusing and weird.